The next day I was still exploring determination in my journal … when suddenly the penny dropped. We pick up the thread. I’m not talking about a goosestepping, maniacal, ego-driven determination to command others, etc. I’m talking about the resuscitation of our ability to stand on our own word, on our own two feet, and stand by that word in the ensuing action. I mean the recovery of self-command and personal responsibility. A friend I spoke to today called it “emerging.” Definitely. Standing forth as one’s self. Finding that self through asserting it, calling it forth. Living as your word. And emerging from the shell of indecision, divided mind, and hesitation. I just know this is part of my mission, to resuscitate our in-touchness with that hidden side of ourselves, the self that needs to emerge, to stand forth. Courage, fearlessness, but also persistence are part of this cast of mind. Determination is an exercise of the will. The will in turn is the active phase of the soul. The will is the one thing I don’t think we’ve developed as much as we might want to. Collective will shows up as missing in our societies. As soon as I’m determined, I notice all doubts are resolved and the ranks are closed. I’m enjoying this experience. Wait a minute. … I just had a realization. What am I thinking of? Who is it that likes the feeling of solidity that comes with feeling determined? Who is it that wants to take a turn at driving the car when determination arises? 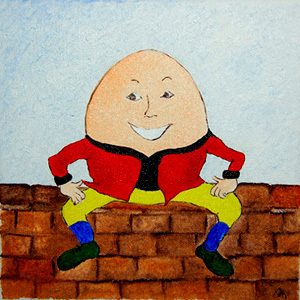 The Humpty Dumpty Man. The man who lived thirty years of his life dissociated, having fractured into a thousand pieces. The man who lived another eighteen after that, trying to put Humpty together again. Humpty came back together again. But he lacked a leader. He was an unemployed, healed and formerly-dissociated person. Psychologically he was idle. No wonder determination feels so good. I’ve never had anyone around who was determined. There was never anyone in the driver’s seat. Or perhaps there were too many anyones, none of them commanding … what? There was no me. I’m in motion again, thanks to this increasing familiarity with my will, which becomes most visible to me at times of strong determination. Being determined is for me like galloping a horse. It’s like driving a Jaguar XKE on open prairie as fast as I can. Top down. Cloudless day. It harnesses some part of me that hasn’t been alive and awake for … a very long time. This is the healing of another vasana and another deep psychological wound. At this point I became a more integrated person, also capable of expressing it into the outside world. If you knew me decades ago, when my will was divided and I lacked strong determination, you wouldn’t recognize the “me” that’s here today. So I want to acknowledge this as … not the end, not the beginning of the end, but the end of the beginning (1) of a long journey to put Humpty together again. I can do the rest now. I can take over from here. There’s an “I” around to lead. Whenever I point out to AAM that nothing tangible has happened yet over the broad spectrum of promised events, he draws my attention inwards and says, words to the effect of, are you the same person you were a couple of years ago? And no, I’m not. I’m strong and substantial, loving and determined. It’s pretty clear to me, and AAM has acknowledged it in direct and indirect statements, that you and I (lightworkers) are experimental subjects, shall we say? Our lives are often fast-tracked to provide examples for the rest of society to imitate or follow. Sometimes we go through incredible suffering to come back and tell the world what that’s like and that it must stop. So the fact that I’m in bliss one moment and not the next, or barreling through the remaining vasanas (if that’s what’s happening) doesn’t surprise me – anymore. This is the life of an experimental subject. Today they’re putting me through my paces, having me heal wounds that have been affecting me since age seven. Tomorrow, it may be you. Where is it all leading? I don’t know. Our sources tell us: To ascension.